​Currently our focus is on our 2015 Production Sale, but we do sell horses private treaty throughout the year. 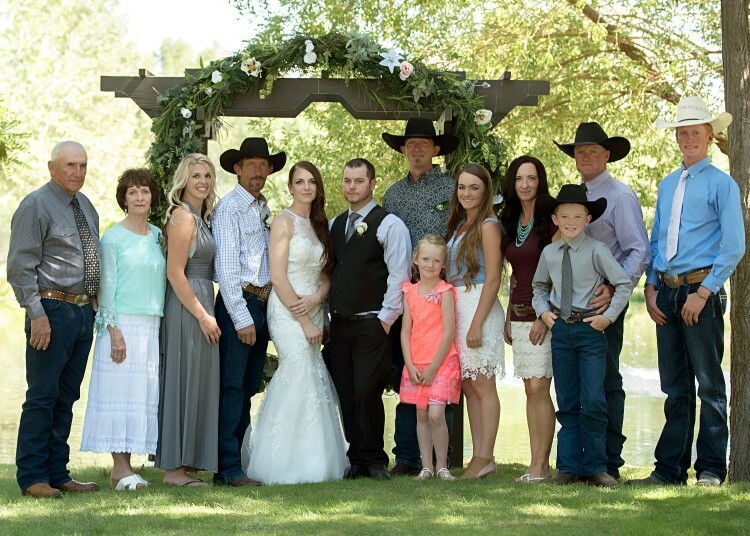 ​Contact us with special requests, or check back to see horses posted here throughout the year. ​individually on the website as their prices may adjust according to their training as time passes. ​will ​have had some arena roping as well. 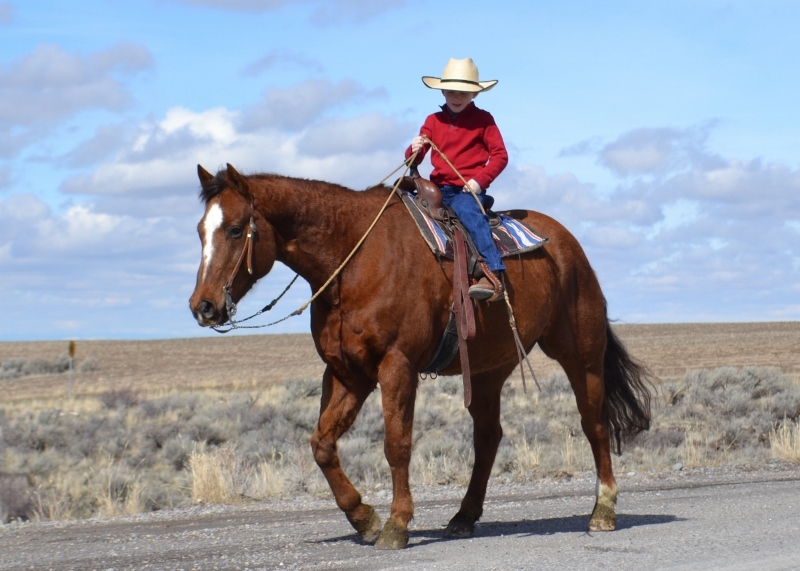 We expect all of our geldings to ride off alone with no hassle, open and shut a gate, go where you point them, be soft in the face and ribs, load, haul, hobble, bath, stand tied quietly, and have overall respectful manners. Every horse is going to have their strengths and weaknesses, but if you will call and visit with us about them we will sure let you know all the details. It is ​important to us that you find the right horse for your needs. ​​So give us a call and we'll help you in your search for "The Perfect Horse For You"!!! 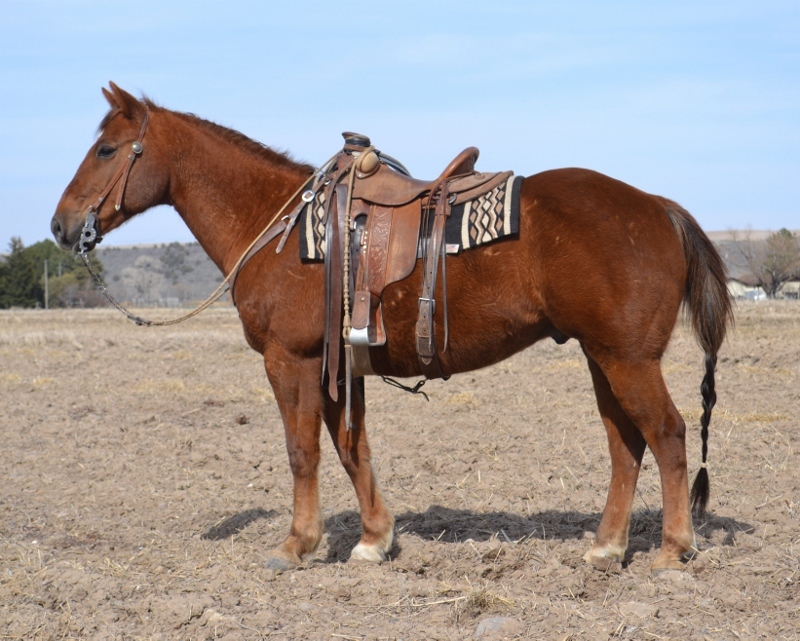 Solid ranch gelding that has seen a million miles of sagebrush and mountain country. 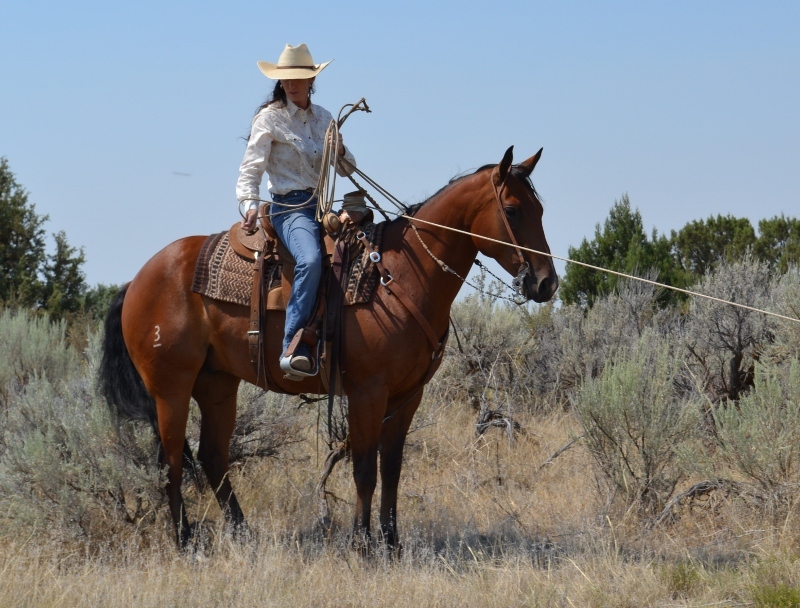 Rides in a solid bridle, for anybody, and can do any ranch job. Breanna and Ty (7) have both used Wally extensively and get a long great. 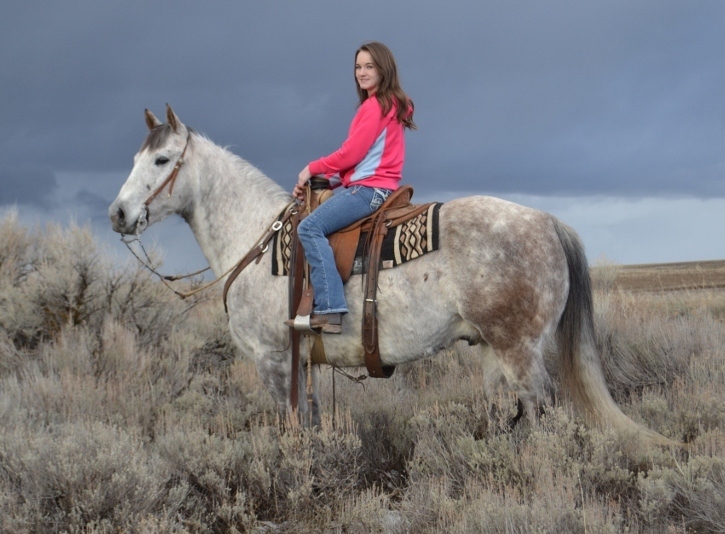 He is very smart in rough country and takes care of himself and rider in tough spots. A big pretty made horse. 15.2 and weigh 1300#. Keen head, shapey hip, good bone and foot. He is tough footed and we have used him a lot of miles barefoot. Would be a great confidence builder for a timid rider that needs a safe one! Questions 208-221-1090 Trail Competitor!! Open Performance Preview!! "Duece" stands 16 hands and will weigh 1400#. 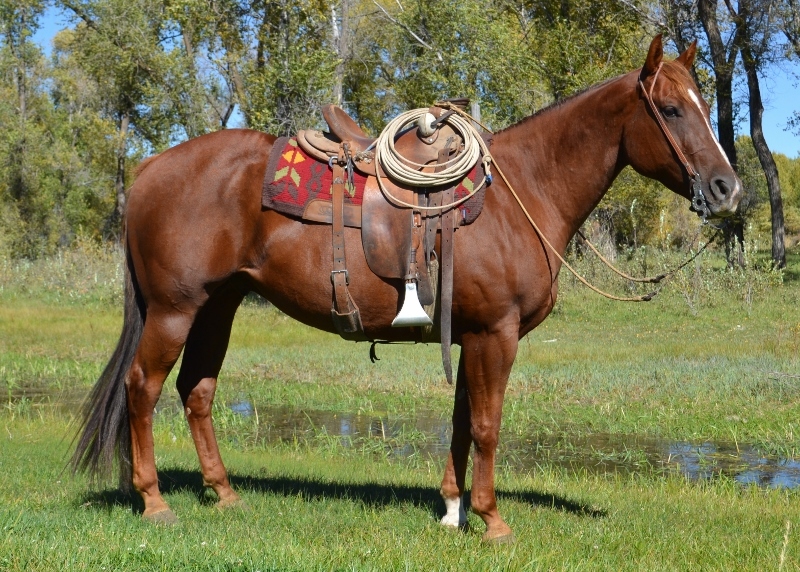 Big fancy gelding with heavy muscle and a nice head. Classy as they come, but in a big package! Very easy going, laid back disposition, and very respectful. He has had a legitimate ranch job most of his life. Lots and lots of cattle roped outside. Becky has used him to brand calves, doctor, sort, and even roped a few in the arena. Breanna and Ty both ride him as well. He is safe and level headed. 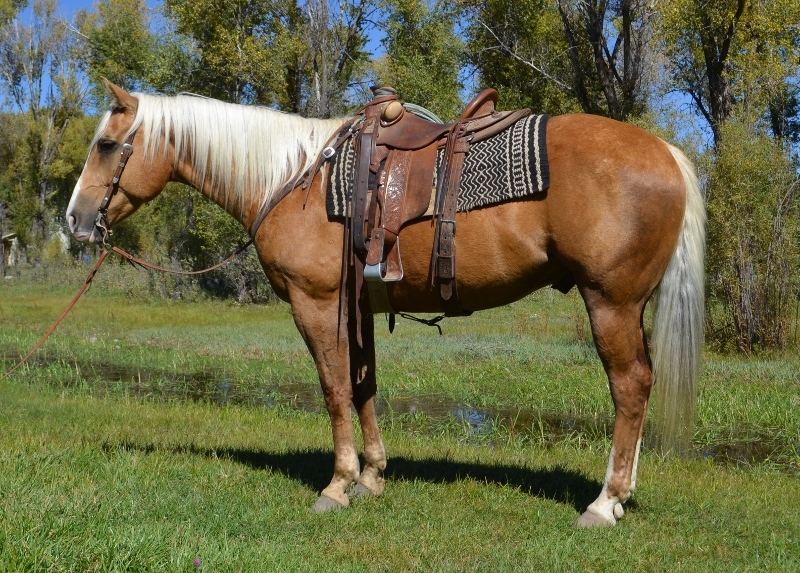 Perfect for a novice person that wants a trail horse that is hassle free and makes for an enjoyable day. We have taught him to get over to the fence, nearby stump, hay bale, etc. for easy mounting. He stands politely and waits for your cue before walking off. He will go anywhere you point him willingly, but pays attention to his terrain also. He has been used enough outside he is very sure footed and smart about rough country. Soft in the bridle and a big stopper! Moves off your legs with ease, takes his leads, and will lope a nice circle. Enjoyable to ride both in the arena or outside on the mountain. Good with his feet, stands quietly to saddle, polite to bridle. Kids can ride him, but he will also be dad's "go to" when there is a job to do. This is the kind that takes years to make, and don't come along very often. We will have more video available later this spring on Duece. "Cool" has been used extensively team roping. Has been hauled to USTRCA and Wrangler Ropings heeling, but heads as well. Stands 14.3 or 15 hands and weighs 1200#. Very good in the box, all business, and will work for a low number roper as well as a tougher roper. He has a real good handle, solid neck rein in any bridle or a string around his neck will work fine too. Soft in the mouth, moves off leg pressure, overall well broke. Gentleman to be around on the ground. Good to shoe, bath, saddle, bridle, etc. Gentle for about anyone. 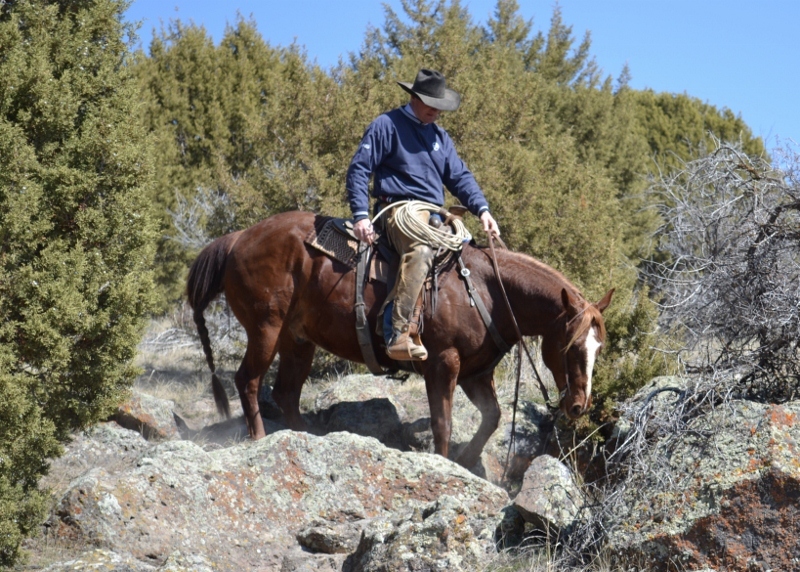 Has been ridden outside gathering cattle off the mountain and trail riding. Branded calves and sorted pairs as well. Would fit an inexperienced person to trail ride and help to keep them safe. Good walk and no hassle! Big handsome buckskin. Skip, stands 16 hands and will weigh 1300#. Kind hearted, likes people, and wants to please. Rides gentle. A real elegant mover. Smooth gaited with a soft lope. Been ridden in the arena and outside. Great foundation. Could go many directions. Color, conformation, and disposition too. 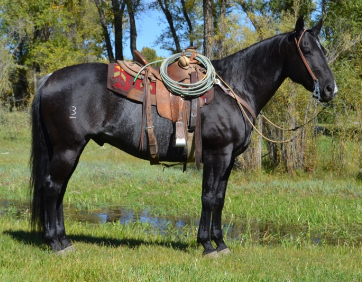 Classy black gelding. Stands 15.2 and will weigh 1250#. Keen head, clean neck, and a lot of size. Good bone. Been used on the ranch and in the mountains. Very cowy. Uses his hind end correct with a big stop. Likes to really walk out and cover the country. Nice one hand neck rein, will ride in any bridle, soft in the face, and sensitive to your legs. Has branded calves and roped some in the arena and outside. Nice broke gelding that you can go get your job done on. Pretty, pretty, pretty!! "Woody" is a family favorite and a Real Eye Catcher! Stands 15.1 and will weigh 1200#. Laid back disposition and likes attention. Rides gentle, soft in the face, moves off leg pressure, uses himself correctly, and reins over the neck with ease. Lots of natural ability. Packs his head down where it belongs and is 100% compliant all the time! Been used in the arena and on the ranch. 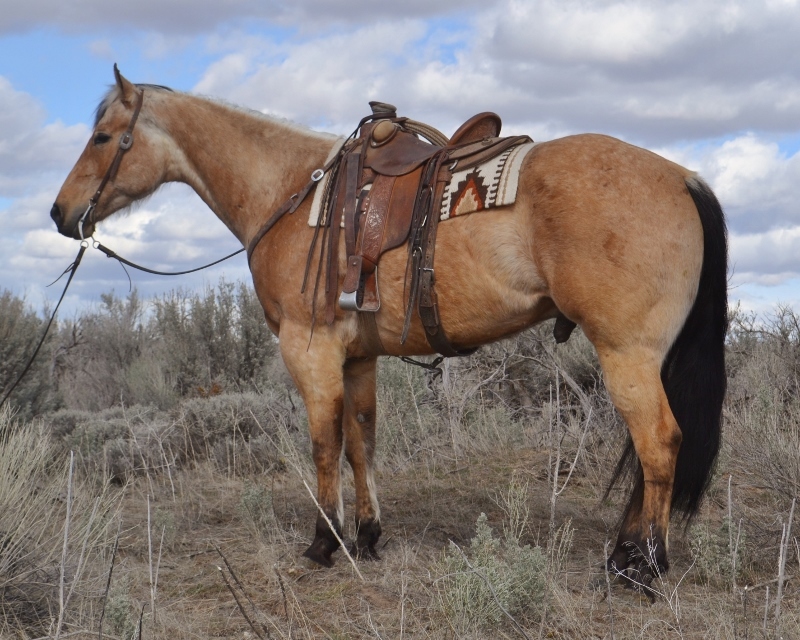 Would make a ranch horse, rope horse, or the ideal trail horse. One the whole family can enjoy! "Pistol" stands 15.3 and will weigh 1300#. Branded lots of calves, sorted pairs, roped both inside and out, ponied colts, penned in the feed yard, and been a million outside miles. Rides one handed, moves off your leg, respectful, and willing. Picks his way through the rocks, brush, and down timber. Will watch a cow with the best of them. Great traveler, rides gentle, and can cover a lot of country. Rides off alone with no fuss and will go anywhere you point him. 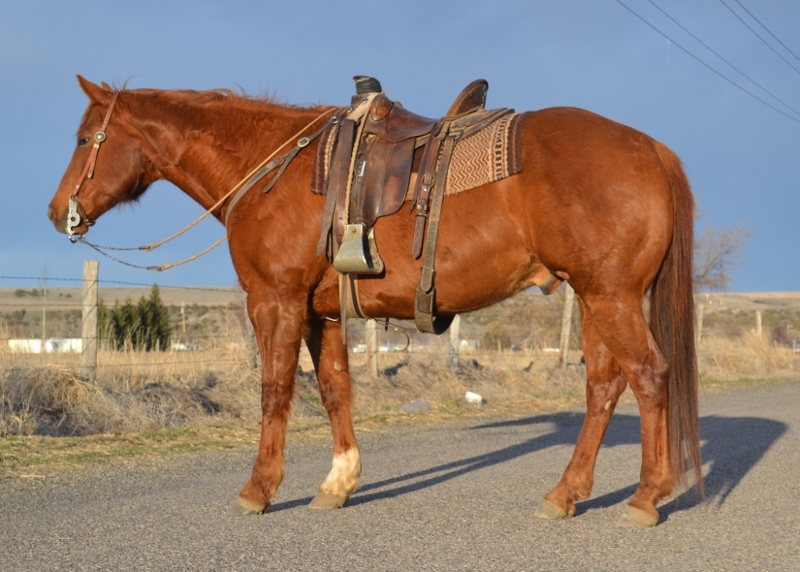 Big sturdy made gelding that can hold up to a hard days work.